The last time I saw my Uncle Niall alive was when he called to see me in Dublin. He informed me that he was up in town to see his Solicitor Liam Lysaght. He told me he was a good Fine Gael Solicitor. Such was his relationship with Lysaght he told me he was confident that he would be able to get a position in Lysaght’s firm for a relative who was just finishing their law degree. After Niall’s death we tried to contact Lysaght & Co.to find out about Niall’s Will. There was no response from them and we were very surprised after a few days to hear that Liam Lysaght was representing the Flynn family. 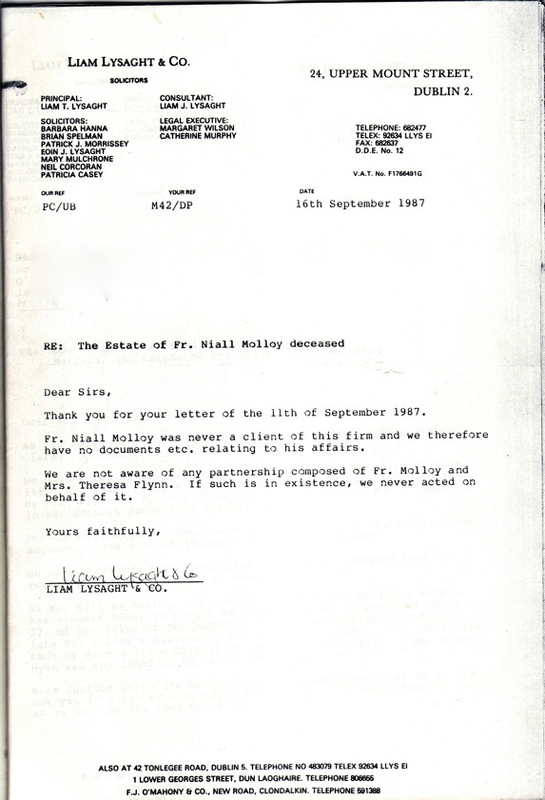 Letter from Liam Lysaght & Co. to Molloy family Solicitor. 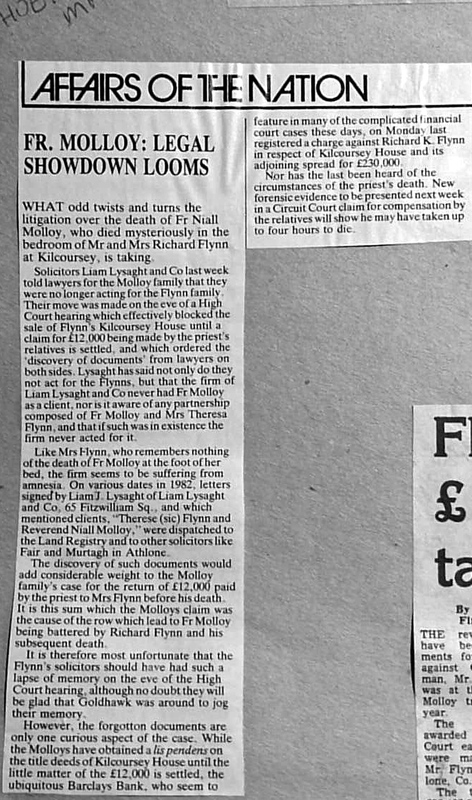 Liam Lysaght acted for the Flynn family after nail’s death. He also acted for Niall even though he denied it for a number of years. 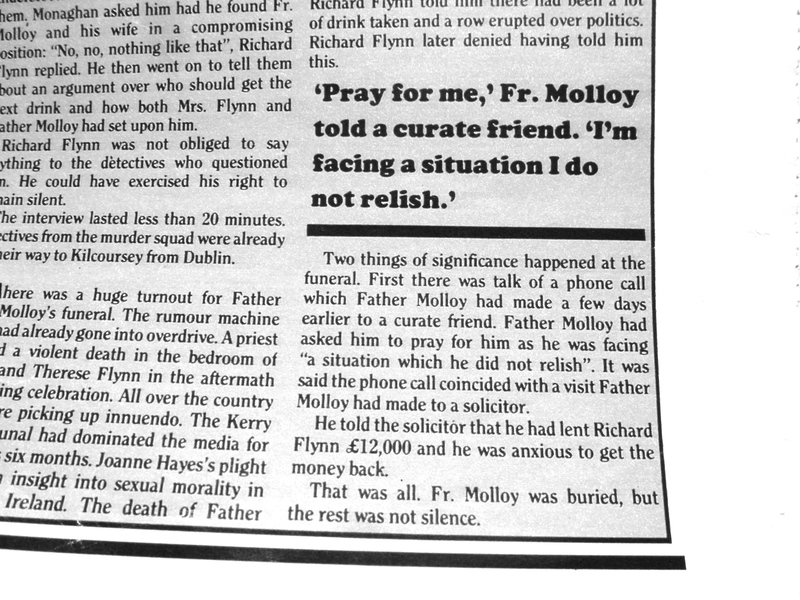 Shortly after Niall’s death hit the national media a friend of mine called to offer his sympathy. He was a Solicitor and worked for Law Firm in Athlone. He informed me that Niall had been in their offices only a few days prior to his death as he called to discuss some matters with a colleague. I informed the family of this and it resulted in my Aunt Suzannah Ryan and my cousin Suzannah Allen calling The Solicitors for a meeting on 15/7/85. They were informed that they did not have a Will but were given details of a transaction where money was given to buy some land around Kilcoursey House. The purchase was dependent on approval being given from the Land Commisiion. 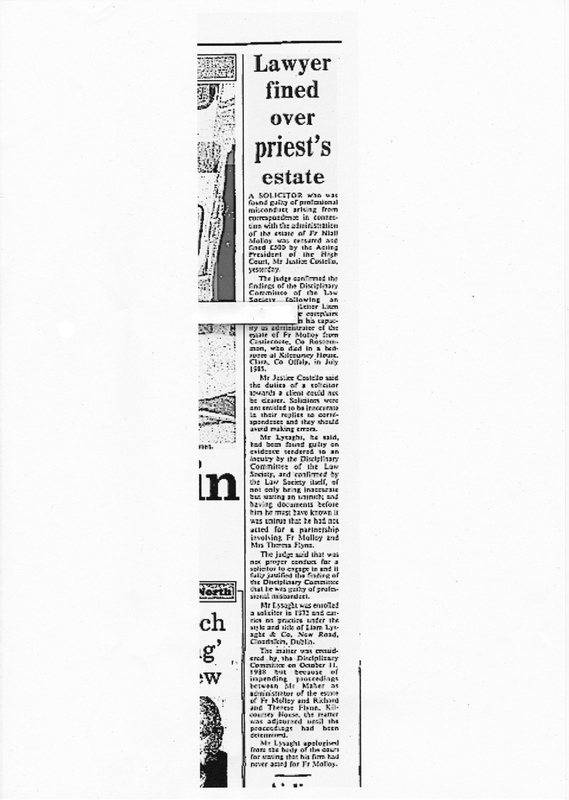 The Land Commission refused to sanction the deal in February 1985 . Niall sought advise as to what to do about the situation. One would have assumed that the Gardai would have interviewed the Solicitor Niall dealt with in the days before his death. Two detectives from Dublin Castle did pay a visit the relevant solicitors but the Cold case unit told me last year that they have no record of the visit. Please check out the Integrity Ireland website Bill.